In the last few years, the Sierra Nevada lineup has been steadily expanding. A year ago, they introduced ESB, aka "Early Spring Beer," the brewery's take on the British Extra Special Bitter style. While I didn't try the 2008 vintage last year, my source at the brewery says that this year's version was superior. The ingredient list is certainly very British sounding. Two-Row Pale, Maris Otter, and Crystal malt varieties make up the backbone. As for hops, English Challenger, East Kent Goldings, U.S. Challenger, U.S. Goldings, & Crystal varieties are employed. As a twist, Sierra Nevada leave the beer unfiltered, which founder and owner Ken Grossman claims "enhances mouthfeel and hop aroma creating a slightly reddish-copper hue." Our ESB combines the best of English tradition with West Coast style. A blend of malts featuring British-grown Maris Otter is balanced with the earthy spiciness of hand-selected English and US hops. The ale is left unfiltered, which enhances mouthfeel and hop aroma creating a slightly reddish-copper hue. Sounds like it's exactly what I'm in the mood for, so let's dig in. Appearance: Amber-orange body with an off-white finger and a half of head with good retention and brilliant lacing. Aroma: Earthy, herbal, and citrusy hops over a lightly toasted caramel malt body. Taste: Sharp citrusy, herbal hops right off the bat. You can really taste that they're using different hops than usual, although they share some characteristics with the usual suspects. The hops ride over a solid caramel malt backbone, strong enough to not be drowned out. Once again, the boys from Chico deliver superb balance. A lingering bitter aftertaste lasts well into your next sip. Mouthfeel: Medium body with moderate carbonation. Dries a bit in the finish. Drinkability: Absolute top-notch drinkability makes ESB a brilliant session beer. Verdict: Another solid and balanced beer from Sierra Nevada and pretty on the mark for the ESB style. Not the most exciting beer in the Sierra Nevada stable, but I think that's part of the point. 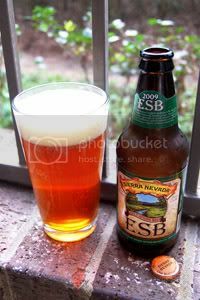 Immanently drinkable, yet complex enough to never be boring, ESB is worth a try for sure. Note: While this review is being published in September, the tasting notes contained within were taken when the beer was fresh this past February.